Dany Sanz crafted Artist Shadow eye shadows like a collection of haute couture colors. An amazingly rich palette of intense shades in 5 effects (matte, satiny, metallic, iridescent, diamond), the range has been entirely renewed in keeping with the brand’s trademark codes: creativity, innovation, rigor, profusion, passion and generosity. Effortlessly create endless eye looks that range from beautifully natural to highly artistic with this unique eye shadow palette. With its breakthrough, gel-powder formula blended with ultrafine pigments, Artist Shadow leaves a smooth, even result that gives lids super-saturated, lasting color. The pearly and matte formulas in the artist shadow collection were developed using two different types of state-of-the-art technology. Artist Shadow pearly shades feature two technical innovations: Water-blend Technology and Pigment atomization. :: Pigment Atomization: brings purity, evenness and extremely intense color. :: Water-Blend Technology: powders, pigments and new 3d gel polymers are mixed with water to create a formula that is heavily loaded with pigments (up to 71.5%). Water is then extracted through evaporation, giving a supple and slightly creamy texture with extremely vivid colors that can be endlessly blended. :: Mother-of-pearl: to add intensity and shine to the color, plus metal oxides and black pigments for all the metallic effects (metal finish). :: The particles of these eye shadows are less volatile which means they don’t fall away during application. :: Pigment micronization: ensures color is pure and even. :: Nylon powder: makes the formula ultra soft so it’s easy to apply and to layer. :: Zinc oxide and talc: ensure optimal hold that stays fast. 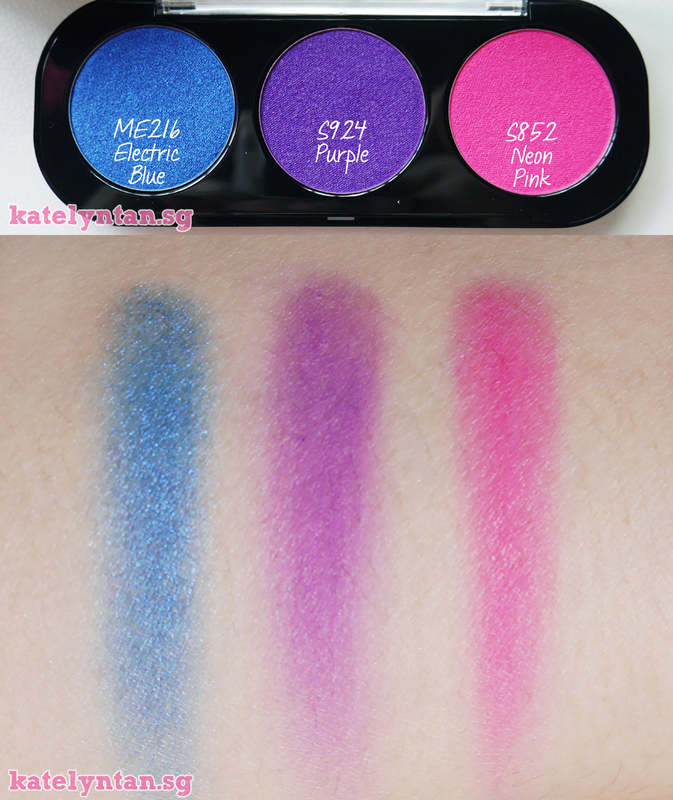 Received 3 pretty Artist Shadow shades from MUFE - ME216 Electric Blue, S924 Purple and S852 Neon Pink! I like the packaging of this product! It's a clear plastic so I can easily tell what shade is inside! It can be a lil hard to depot though cause the magnet is really strong but I found a way to depot easily with my nails hahas. First I will use my nail to shift the pot to the bottom left corner, then use my nail to lift it from the top right corner! Initially I used a toothpick and my lousy toothpick broke lols. These eyeshadows are really pigmented, glide on smoothly and leave a smooth finish! 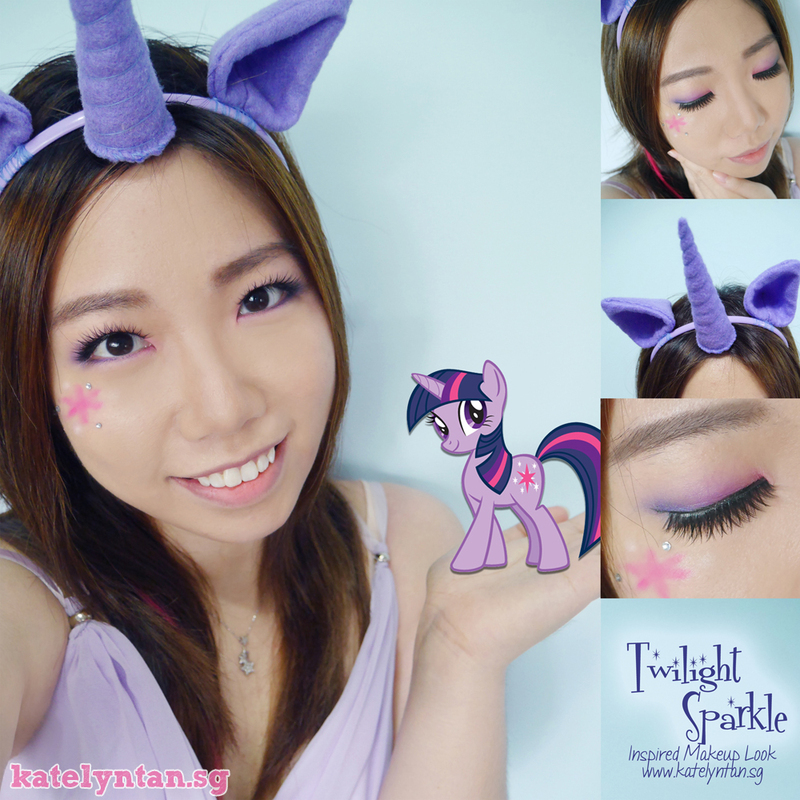 I like these eyeshadows a lot cause they are pigmented yet very blend-able so I control the intensity applied! This eyeshadow can be a lil pricey, this is definitely a high end eyeshadow, but you will get a lot of product (0.07oz) for the price paid! The following colors were created for use on cheeks: Frosted Peach, Mahogany, Mandarin, Rust, Pumpkin, Copper Red, Watermelon, Electric Coral, Coral Pink, Golden Pink, Electric Purple, Tangerine, Poppy, Milk Toffee, Peach, Bisque, Salmon, Orange,Tomato, Coral, Grenadine,Tea Pink, Light Rosewood, Purple, Canyon, Apricot, Auburn, Flesh-colored Pink, Rosewood, Dark Purple Pink, Eggplant. Well... Blue, Purple, Pink, what do they remind you of? The moment I shade these three shades, I was like "TWILIGHT SPARKLE!". Used this photo to join Clozette's Tricks For Treats contest. P.S One lucky voter will stand to win $250 worth of MAC Cosmetics too! Just look at how blendable the eyeshadows are! Used all three shades on my eyelids. My Sigma brushes don't really pick up the pigments well. So I ended up using the brushes in my MUFE palettes and picked up the pigments really well! Cases are available in singles, duos and trios and sold separately at $9 each!